Last week's episode ended with Team Joanna finally breaking Team Claudia's streak and claiming their first victory. However, that was only for the Men's Light Heavyweight division and Claudia still has a chance to sweep the Women's Strawweight division. The last fight of the preliminaries is Kate Jackson vs. Ashley Yoder. Aside from the fight itself, this episode was largely uneventful. No bickering between the coaches; when Joanna saw Claudia was wearing the same shirt as her, she sarcastically complimented her. Claudia snarked that it looked better on herself, and Joanna does not argue. There could be peace in our time yet. Cory Hendricks learned from his doctor that he does not have a herniated disc and he mostly just needs rest and pain management; unless something changes in the next few days, he should have no problem competing in the semi-finals. The rest of the episode is something like a training montage, sans inspirational music. Kate Jackson is from Cornwall, England. In 2013, she fought and lost to Coach Joanna in the PLMMA 17 event. Kate says she's worked on the mistakes she made then and thinks she's improved. She also thinks she's observed Ashley enough to learn her patterns (she's a southpaw, tends to kick off her back leg, etc.) and plans on staying out of her range or so close as to stifle her. Claudia's coaching team are psyching her up; they insist Kate has "a beast inside her" and when she gets in the cage, she's got to unleash the beast! We see Ashley train, but even more time is focused on the coaches, Joanna and Claudia. In case you've forgot, this season will culminate at the finale where Joanna and Claudia will fight for the second time, with Joanna's Strawweight Championship on the line. Dana White's promoting this fight as one of the best of the year. So, during this season, when the coaches aren't training their students, they are doing training of their own. Claudia talks about her past over her training montage about how she grew up in Mossoró and later Natal, Brazil, and how being a fighter and winning the championship from Joanna is important to her, as she wants to prove that even people of her hometown and humble beginnings can make something of their lives. When she was a young teenager, she attended an MMA event, saw her first female fight, and met Jair Lourenço, the head coach of the 'Kimura Nova União' fight gym in Natal. It's been upward and onward ever since. Joanna segment has a different tone, she's having dinner with her assistant coaches at a family gathering. Joanna says she's getting more motivated to fight Claudia, now that the date is approaching. She says Claudia's trash talk just leaves even less room for excuses once she beats her. 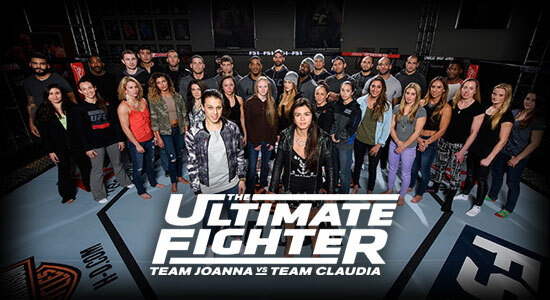 Joanna is convinced that she's going to beat Claudia on the ground, while Claudia is convinced that Joanna can't handle a fight on the ground. I guess we'll see who has better Brazilian Jiu-jitsu skills on July 8th! Ashley comes to the cage draped in the American flag. Kate comes draped in the flag of Saint Piran's, the Patron Saint of Cornwall. Both rounds see Ashley unable to connect with most of her strikes against Kate, with Kate eventually taking Ashley down to the mat. Ashley goes for armbars in both rounds, but to no avail. On the aftershow TUF Talk, Ashley speculates that she might have been greedy in going for an armbar in the second round, and if she had taken Kate's back, it might have played more to her advantage. We can only speculate as after two rounds, the judges favor Kate Jackson by unanimous decision. Team Joanna has been swept in the Women's Strawweight division and now Team Claudia's ladies will have to face off against their teammates in the semi-finals, starting next week!